Batwoman and Batman have gone from friends to enemies - and Bruce Wayne will be killed for it. That's according to James Tynion IV's Detective Comics run, introducing a terrifying future in which a feud between Tim Drake and Batwoman becomes a bloody vendetta. 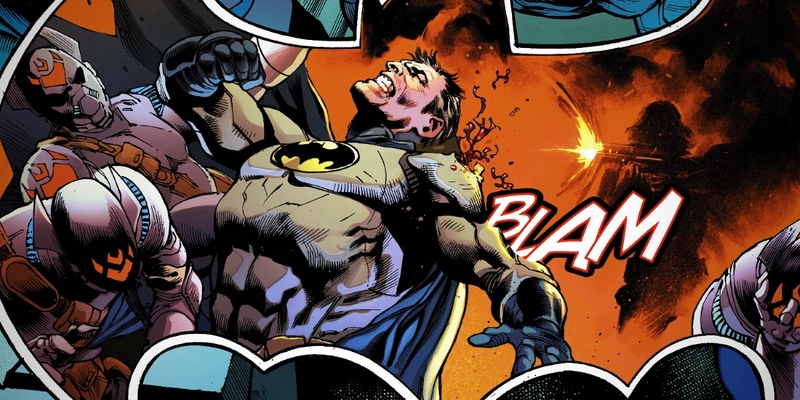 Detective Comics #977 has finally revealed just what could drive a final wedge between these heroes, and it's a chilling answer. Apparently, Batwoman kills Batman in DC's future. A future becoming more and more possible by the day. Tynion's run has been a fascinating one, with the Dark Knight assembling a team of old and new allies. Tim Drake's Robin was seemingly killed as part of the early Rebirth mystery, only returning in pursuit of a twisted future version of himself who became Batman. This future Tim Drake made several attempts to assassinate Batwoman, believing her to be a terrible threat. It turns out future Tim may have been right, after all. Although Batman and his allies stopped him, and recovered their own Tim Drake, the future he warned against keeps taking shape. Batwoman has killed a Batman ally, which led her to leave the team and form her own army of team of Bat-Family hunters. Detective Comics #977 opens with another vision of the future. Exposed to advanced technology, Drake is given a glimpse of a key event in the timeline: Batman's death. In this timeline, Drake has left Gotham to attend Ivy University, only to see a news broadcast showing Gotham City has been officially declared No-Man's Land. The President of the United States has authorized sending in a task-force to neutralize Batman. Led by Batwoman, the Colony's forces attack Wayne Manor, calling on Batman to surrender. Needless to say, that doesn't happen. Batman tears through the Colony's finest with ease, but he's ultimately brought face-to-face with Batwoman. Holding a gun to Bruce Wayne's head, she calls for the Dark Knight to surrender. "You know damn well that was never going to happen," Bruce snarles back. And, by order of the President, Batwoman pulls the trigger - right before Tim Drake arrives. It's a chilling introduction to the issue, giving a very real sense of the stakes. Why has the U.S. President decided Batman is dangerous? Why is Kate actually willing to shoot Bruce Wayne dead? So much of this timeline remains a mystery, but what's really exciting is seeing how this future affects the present. The present-day Tim Drake is haunted by this vision, desperate to avert his mentor's death. Batwoman is already positioning herself as an enemy. So what steps will Drake go to in order to defeat her? Is it possible that, to save Bruce Wayne, Drake must actually become the murderous Batman he met from the future? Tynion's story has already taken a lot of unexpected twists and turns, and no doubt more are to come. Detective Comics #977 is now available from DC Comics.